This is a special two part episode of the KnitBritish podcast, where I visit Uist Wool. I was very fortunate to have had the chance to visit there in May and my visit has really stayed with me! This episode is in two parts because of upload limits and length. On iTunes and podcatchers you will find these as two separate parts. Uist Wool has interested me ever since I saw their stall at the Highland Wool Festival, in Dingwall, in 2014. At that point they were a funded training project, aimed at bringing back skills in wool-work to Uist. They had recently completed work on their mill and as well as bringing back these skills to the islands – islands so rich in wool heritage – they were also committed to getting crofters a better return on their clips. I can remember seeing their stall at the HWF and thinking that I looked forward to watching their progress! The idea behind Uist Wool pays a great debt to Mary Norton, from Uist, who had seen what her friend Libby Mills had done for local wool in setting up the Green Mountain Spinnery, in Vermont and wondered if the same could be achieved in Uist. Dana MacPhee, who was working at Taigh Chearsabhagh Museum & Arts Centre at the time, came in on the wool development group as a volunteer and then as Project coordinator as the project continued. The Wool Centre officially opened its doors in November and they have been trading as a Community Benefit Company since then. Anyone who saw Uist Wool at Edinburgh Yarn Festival, or Woolfest, or has fallen down the rabbit hole of their online shop can tell you that their yarns speak chapter and verse of local wool, with a story and a tangible culture (intangible too, with the use of Gaelic language). However, as you will hear, it took a lot of fundraising, awareness-raising and a heck of a lot of passion for place, an eagerness for learning and knowledge about wool and sheer determination at times. Dana, now director of the Uist Wool, is the vital spark and driving force who has taken Uist Wool to where it is today, along with the Wool Development Group and the amazingly skilled and knowledgeable team of mill staff. Join myself and Dana in the first part as we talk about the mill from its inception to the present and what might be in store for Uist Wool in the future. Dana is utterly driven to give local crofters a better price for their fleece, rather than sending it to the wool marketing board and she says if the mill does well, it means that the benefit gets passed back to the wool grower with an increase in the annual wool clip payments. 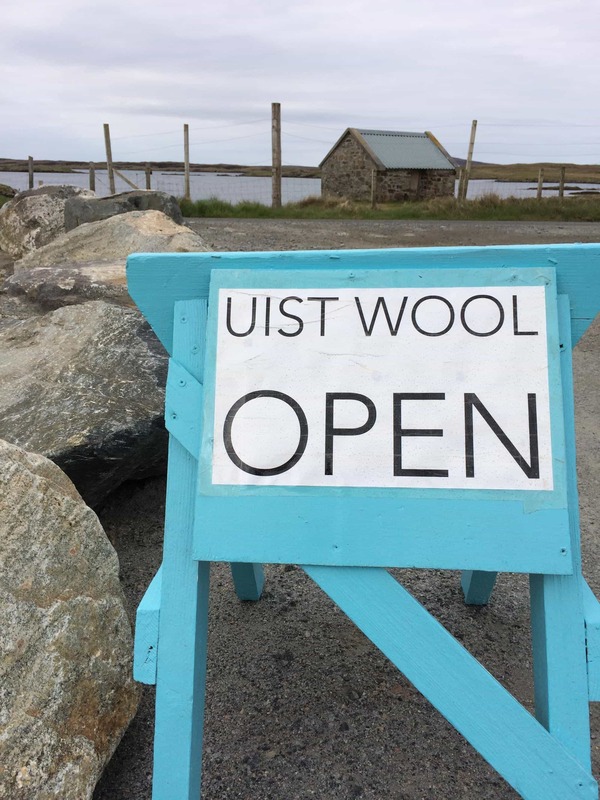 Now that Uist Wool is trading the emphasis is on getting the word out further and selling those incredible local wool yarns, even if parting with the yarn can be a bit difficult sometimes. Dana also confessed that she would not call herself a knitter – though she was wearing a Nuuk, in their Fras yarn, knitted by her own fair hands. I wondered how she came to be making yarn with such passion and knowledge and she tells us about her background, which features training in constructed textiles, but it is her work in local museums and the heritage and her passion for place that really piqued her interest. Since becoming involved with the project and being on this incredible learning journey she has learned more about wool and appreciate knitting more too. The sky is now the limit when you have a beautifully curated yarn showroom next to your office! We’ll delve in that wool shop in the next part (below). 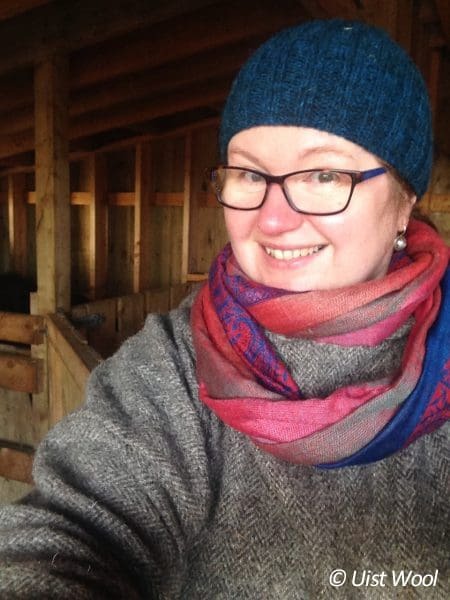 Hazel Smith first came to the Western Isles whilst studying at Sheffield University and it was during this trip that she learned about Uist Wool and took part in some of the training days. Hazel was originally working with the RSPB in Uist, but with further training available at the mill and the opportunity of a job, would you say no? Get your second cuppa and listen as Hazel takes us on the journey that wool takes around the mill. First we go to the woolshed – we meet Marple the dog who is keeping a keen eye on things. Hazel talks about how the mill goes out to the croft for the fleeces and it comes into the shed. It is then graded. Uist Wool used 9 grades and the best fleece for them is a medium staple (3-6 inches) with a soft handle. We also talk a bit about some of the breeds that are local, and some of the fleece that they buy from neighbouring islands, or the Scottish mainland. Uist Wool aren’t spinning to commission, they do not have capacity at the moment, but their business model is to generate wool-brokering for the community and sell yarn for the business. After grading and picking, we go into the rebuilt byre, which is the wash house. Beds of washed locks of Cheviot X and a lovely air of sheepy scent meet us. as does Fiona, who tells us a bit about the washing process. Then we go into the mill and watch some incredible pieces of machinery – of all ages – process a Shetland blend. I also spoke to mill technician Maddie, who was setting about carding that blend and we talked about how she came to be working at the mill. look at that lovely sliver of wool! THEN we go into the shop and Hazel talks us through some of the yarns, and the wool products. Many of the yarns are DK, with some incredible 4plys, such as the Scottish merino Canach and the new Trusadah Las and Las Glas yarns – the latter being a blend of Scotch Mule and Wensleydale! Hazel also shows off the pattern kits, designed by Flora Kennedy and created in Uist Wool. Lovage and its deep ribs and curving shapes and Tarasgeir, with lovely lace details really show what these local wools and blends can do. You can buy these as single patterns, as well as kits. This blog post would be TRULY gargantuan if I wrote down every single yarn available, but you can hear us talk about them all in the audio and you can find the yarns at uistwool.com. I think my personal favourite yarns are Reothart, Conntraigh, Fras and Dile – These yarns have been blended with Cheviot and Zwartbles and Cheviot and Hebridean to such incredible effects and I think these are the kind of yarns that will blow minds! Bouncy, yieldy and incredibly local yarns which have been created with such knowledge and care – and via the hard work of a lot of dedicated people. Wool and wool-work has been so integral to the Outer Hebrides and while Uist Wool are real tradition bearers they are respectful of ther past, but forging ahead with these artisan yarns, championing local wool, local crofters and securing a future for wool and milling in Uist. Long may their good work continue. Thank you so much to Dana, Hazel, Fiona, Maddie, Neil and Toby who all made me so very welcome at the mill. Thanks so much for your hospitality and for being so generous with your time. Update: Uist Wool have offered 10% off sales in their online shop. Use code knitbritish89 . That is incredibly generous of them and I know you will be happy to partake of it! This code is valid till 31st August 2017. Music used all by Doctor Turtle. Part one – Intro , Ladies Take Me With You. Other music in part one, and part two intro: It Looks Like The Future, But It Feels Like the Past. Other music used in episode two – Beaconsfield Villas Stomp. Images are copyright to those mentioned in the caption or accompanying info, other images are mine. My visit to Uist Wool was at my own expense. Got in v late last night and tried to resist but couldn’t. Listened to part 1 and it ended at 1.35am. Can’t wait to listen to the 2nd. Dana’s enthusiasm just jumps out at you and her beautiful Western Isles lilt makes her a joy to listen to. And that yarn! The pictures are gorgeous and now I want to feel it and smell it and knit with it and buy it!!!!!! Have just spent the morning in my jammies, with a large cup of tea and my knitting listening to both parts. Such great interviews Louise and a lovely insight into the yarn production. I love that this company is so fuelled by the passions of these women ( and I love that they are mostly women), their community, the island’s history and culture – it’s all fantastic. I’ve knitted a Nuuk too in their yarn and can vouch for how wonderful the natural colours and feel of the yarn is and I think I need a SQ of Fras too. Thank you for bringing us their story – it makes knitting with their yarn so much more special. I am hoping to finish another project in their yarn before my own trip to Uist in the autumn. Thank you! I loved being there! Not to be a yarn pusher, but I’ve just updated this post with a very kind discount code from Dana! Oh wow – well that decides a few things then. Good thing it’s payday tomorrow. How lovely of them. Thanks for all this wonderful content Louise! I so enjoyed listening to these wonderful and resourceful people talk about their passion for wool and community. I purchased some slubbing cakes at EYF this year and then ordered some more from their website (ordering from them is easy and pleasurable and the customer service is great), a blend of Cheviot and Hebridean. Spinning up the slubbing was so much fun! It was so fast to spin up such fine pencil roving and they made some amazing bouncy yarn. I would highly recommend them to any spinners out there! What a lovely set of episodes. Enjoyed listening to them (while painting my bathroom, lol). Love how all the people involved spoke with such passion of their products (and machines :D). Hope to see Uist wool at the eyf next year, because it certainly triggered my curiousness about their yarns. Thanks for these fascinating insights into the way these yarns are produced. I bought some Canach in each colour at EYF and have recently cast on ‘Find Your Fade’. The yarn is unbelievably soft and the neps just help the colours blend even more. I wish them all every success – they’re doing something really special up there on Uist. Having a lovely Sunday moment reading through these kind amazing messages: thank you all so much: especially to Louise for coming to see us and making TWO special episodes. We feel truly honoured to work at Uist Wool, and it’s always great fun. The best thing about Part 2? Your lovely spontaneous gasps as each new yarn was revealed to you in the shop! Thank you for the terrific episodes from Uist…I always find it endlessly fascinating learning how yarn is produced by small companies…a huge amount of research and work by a highly focussed team. Your enthusiasm for the whole process is wonderful to hear and wings its way across the oceans to here in Western Australia. I am very unlikely to visit Uist in the near future but I now feel as though I have been there in a small way…. KnitBritish, SpinBritish, WeaveBritish, CrochetBritish, MacrameBritish… it doesn’t matter what your craft is, the main message is to support and #LoveLocalWool! I’m so glad you’re enjoying the podcasts. Thanks so much for listening. Such very interesting podcasts. How lovely to hear about all that is happening there in Uist. It sounds like a fascinating place to visit. I visited a woolen mill-turned-museum in France a few years ago and was reminded of that tour as I listened. The yarn looks so scrumptious- probably wonderful for a hap! Visited the mill and shop last week in person whilst on holiday. It was fabulous to see how so much has changed in the last year from the house to the mill and real shop. The your brought it alive. I have sheep by the house and do many processes by hand. I love carding! Inspirational at uist wool. Bought some wool now ordering more online and have a special waistcoat to crochet for a birthday. Will post result when project completed. Want to move to Scotland as soon as I can find job and affordable house combo. Thanks again. Lovely – and very interestiing. Uist Wool’s wool is drawn in from a wide catchment, and a good deal of it from the mainland. It may surprise subscribers to know that Uist Wool doesn’t exist to serve Uist crofters and producers, but is set up in competition with them! Uist Wool is in business for itself. There are, in Uist, two other independent businesses. Both sell a range of yarns produced with wool from the sheep on their own crofts (and some from the crofts of their close neighbours). Bizarrely, they have to send their wool away to mainland micro-mills for spinning, as Uist Wool doesn’t provide services to Uist crofters, but has – amazingly – set up in competition with them. 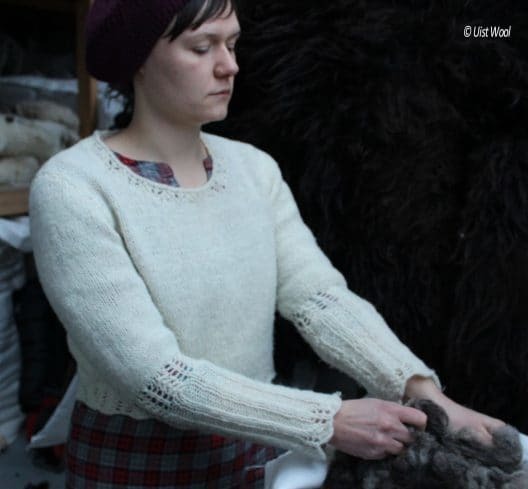 These small independent producers – more genuinely local than Uist Wool – deserve your support. See http://www.birlinnyarn.co.uk/ (Isle of Berneray) and http://hebrideanwoolshed.scot (Isle of Eriskay). The latter is our own undertaking. We’ve been craft spinners, dyers and weavers for 40 years, and producers of our own mill-spun yarns (from our own sheep) for 10 years. The majority of our work is still the hand/craft product, but the majority of the volume of fleece from our own sheep (and the fleeces we buy from our next-door neighbours) goes for spinning at the Natural Fibre Company in Launceston, Cornwall. That may seem crazy, but spinning of a year’s wool crop costs many thousands of pounds, and relies on the skills experience and good sense of the spinners, who we see as trusted collaborators – not merely a commercial service. That’s really what we needed from Uist Wool, but unfortunately a great deal of public money has gone into setting up a competitor (and a massively subsidized one at that), not a collaborator. I was going to reply to this comment with an email but then decided as you had posted publicly I would give you the same courtesy. Firstly, let me be very clear – I am not a mouthpiece of Uist Wool – they can answer every question you have, if you care to take your questions there. As a community benefit company they need to be quite transparent about how they operate. However, seeing as you have chosen to make some assertions here on the comments, let me tell you of my experience there and my own opinions of their operation. May I ask if you listened to the episode or if you just read the post here? These show notes only encapsulate what you can hear in both parts of the episode. It’s roughly an hour and a half of your time, but I recommend you listen, if you can. And really I know I should stop there, because the reason I suggest you listen is because both Dana and Hazel talk at length about most of the points you raise here and explain the reasons why. However I won’t stop there and I will try not to repeat too much what they say in the recording – I already know my reply will be enough for you to wade through without me repeating their words here too. Let me explain what KnitBritish means to me and why I promote the idea of #lovelocalwool. The purpose of my blog and podcast primarily has always been to tell others about the wool that I use myself in hope that they also learn a little bit about the UK wool scene and perhaps take that interest further into their own crafting. When it comes to supporting “local” that can mean what’s being produced on your doorstep, wider location, county, state or country – depending on what actually is available to buy. Also, I promote love local wool because a great many of my listeners (this episode has had about 13 k listens) are not able to buy British wool due to their location and postage costs, etc. What is also very important to me and has become patently clear in my 4 years of knitting British is that, for the most part (though there are exceptions!) people involved in small wool businesses are generally supportive of other people involved with small wool businesses and grass roots wool workers, who are all (mostly) able to do what they do alongside the others. All connected by wool, all for the good of the local community and economy and for the good of the wider wool industry too. Community feelings like this are not unknown to knitters, crafters and wool lovers too. We feel connected to one another in our craft and connected to those wool businesses with the yarn we create with. When it comes to my interest in Uist Wool, I suggested the visit out of my own interest and safe in the knowledge that others would enjoy hearing about it and maybe learn about Uist and the mill for the first time. I paid for the trip myself – in case you’re wondering if any of that ‘public money’ went towards it! There was no sponsorship of any kind from Uist Wool (again, in case you wondered) and I’m always upfront about that info at the bottom of every post. The relationship they have with local crofters, which I got to see first-hand, is an important and valuable one; not only can the mill pay good prices but they are able to show and educate crofters on just what kind of fleeces make great yarns, they are showing that wool may be a by-product, but it doesn’t all need to be burned, buried or used as slug repellent; they are showing them the value that we crafters place on native and local breed wool – making important connections again from raw product, from croft to craft. They are indeed also buying different fleece from the Scottish mainland (local in terms of wool miles.. I’m sure you can agree) and again, if you listen to the show you can glean more info on this. I also observe the hard work they put into connecting Uist to people all over the world – they maintain a cracking website with shop and an active social media which shows every part of the process wool takes through the mill and they show off the beauty of Uist to their followers. Again, connecting with people in a way that has a knock on, further effect on people. I also know that quite a few of their social media followers have visited Uist this summer on the strength of their social media! A nice wee boost for the local economy there too! The skill and knowledge they have in their team is, in my opinion, what we need more of if small wool businesses are to thrive in the UK and the wool and yarn industry is to have any kind of a future here. Their innovative in creating yarns is also so valuable too and they are creating blends and yarns that you cannot find commercially spun anywhere else. I could go on, but again, all of this is in the episodes – my opinions formed having spent time there, asking questions and having a modicum of understanding of what is important to yarn buyers..
Money you say is public (Also made up of donations, loans…again all in the audio and freely available elsewhere) are funds that are available for those who are eligible and up to the task of the mammoth work involved in the application process. This money is not handed out like sweeties and nor should it be a bone of contention to have eligible groups apply for it and be awarded it! A good deal of that money has gone to training those very skilled and knowledgeable staff at the mill, whose craftsmanship goes into these yarns that are so coveted by wool lovers. I’m sure I don’t need to go into the importance of keeping alive and evolving such skills in a place with a rich wool- work heritage and history, being local yourselves. I don’t know if you also comment on behalf of Birlinn or you are just drawing her in to your own argument. I’m very aware of Birlinn – we featured them on Wovember, an annual wool campaign i co-edit and i regularly share her tweets. However if you are indeed telling me I should be promoting and supporting you in exclusion to others, I think you may find your efforts meet with the opposite effect. There’s no place for such parochial and narrow thinking in an industry that needs support and positive forward motion, like the UK independent wool industry does. This was a comment I would have gladly trashed for the rude way that you have communicated. I should have opted for the much shorter reply of “Thanks for your feedback, please listen to the episodes for the answer to your questions”, but as you have decided to furnish us all with your opinion, I have responded likewise. We’re sorry you have taken such offence at our comment – but you didn’t have to approve it, let alone reply to it! You’ve read into our comment a malice that we don’t feel, and a campaign that doesn’t exist. We wish Uist Wool well. Birlinn Wool too. Genuinely. We really don’t mind (level playing field) competition! We delight in and encourage the enterprise and skills of others who, like us, endeavour to be the best they can – especially those that do so from their own resources. They deserve more notice than they get. Perhaps that’s all we should have said. Once again, apologies for any (unintended) offence. Previous Postepisode 88 – The one with Shetlands, Romney, Alpaca, BFLs, Merino, Mules and silk!